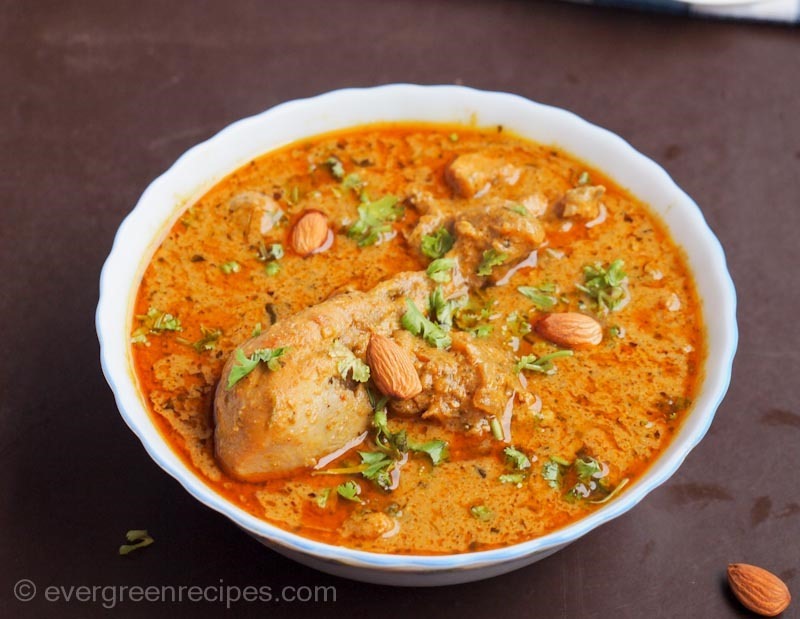 Presenting my recipe of Badami Chicken Korma, something every chicken lover will love having. It’s been weeks that I have been sharing only the veg recipes on the blog, which means I didn’t prepare non-veg for the family in a long time. And now that my Son is growing, we have a majority of non-veg lovers in out home, The Husband and Son. So, I prepared it for them. Even though I am as efficient in Non-Veg as I am in Veg recipes, it still takes a bit longer for the Non-Veg recipes. So, it was a good idea to try something different and get a new recipe for the blog as well. See, when you are a busy mother, you have to be creative in making time for everything. :-). 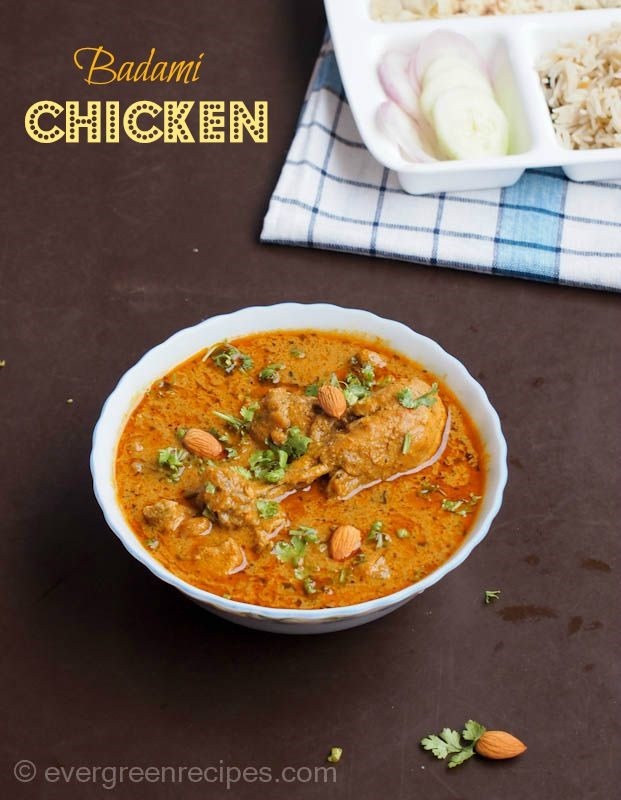 Some creativity and a bit of thinking lead to this recipe of Badami Chicken Korma that has a super delicious flavor of curry ( Yes, I easy the curry so I guess I am a partial Vegetarian). You too can have this recipe at home by follow the easy step by step recipe along with photos. I hope you will love this one as well. 1. Take all the ingredients given in table “Ingredients for marinating the chicken” in a bowl and mix it well. Keep it aside for marinating the chicken for 2-3 hours. 2. Soak the almonds in hot water for 15-20 minutes. Peel of the skin of almonds. 3. Take almonds in a grinder along with some water to make a fine almond paste. Keep it aside. 4. Heat the pressure cooker with oil, and add onions. Fry it till onions are dark golden brown in the color. Take out the fried onions from the oil and let it cool at room temperature. 5. Take the fried onions in a grinder and add 1/4 cup of water. Grind it to make a fine paste. Keep it aside. 6. In the same cooker in which you fried the onions, temper with bay leaf, cinnamon stick and cardamom green. Then add chopped tomato. Grind all the ingredients together given in the table “ Ingredients to grind the paste for Korma” to make a fine paste. 7. Add this ground paste in the cooker and add salt. Cook the spices on a medium flame for 5-6 minutes. keep stirring in between the process to prevent it from the burning. 8. Add in green chilly and ground onion paste. Mix it well. 9. Add ground almonds paste in the cooker and cook the spices on low flame for another 4-5 minutes. Then add turmeric powder and red chilly powder. 10. Add Beaten curd in the cooker. Cook the spices on a slow flame till oil shows separately. Then add chopped capsicum and keep the flame very low. 11. Heat another wok with 3 tablespoon oil and add the marinated chicken. Fry the chicken on a medium flame for 6-7 minutes till oil shows separately. 12. Add fried chicken into the pressure cooker and add Kasoori methi. Mix it well. 13. Add 1 glass of water, mix it well and check the salt. Close the lid and pressure cook it on high heat for one whistle and then low the flame and cook for another 4-5 minutes. Switch off the flame, let the pressure settle down. Open cooker, add Kewra water and chopped coriander leaves. 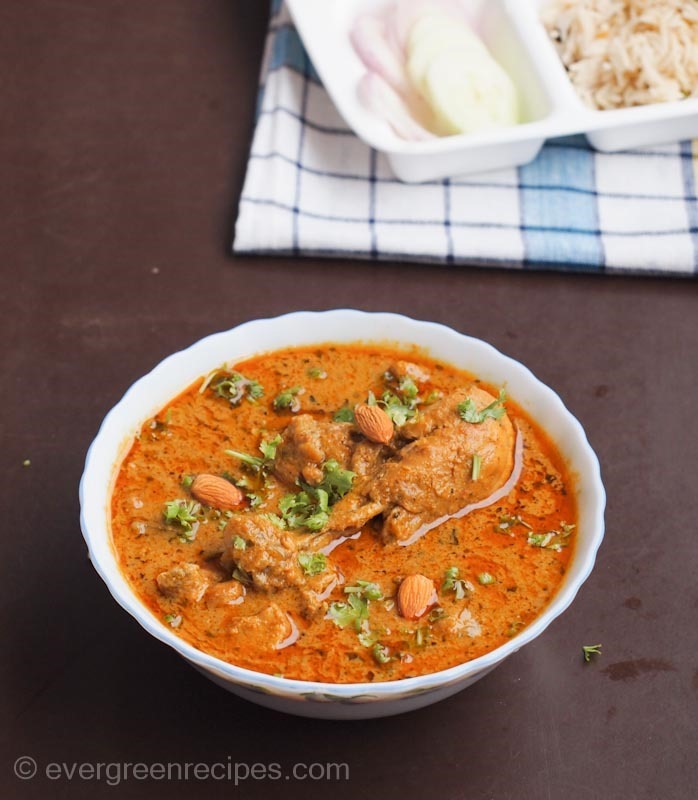 Delicious Badami Chicken korma is ready to serve, Serve hot with chapatti, Naan and Pulav.